"Hollywood often makes socks," Cuaron said. "I work with the studios when they decide they want to make a film and not socks." In Guillermo Del Toro's "Pan's Labyrinth," up for six Oscars including best foreign-language film, fascist soldiers in post civil-war Spain torture rebels as an eyeless, child-devouring demon lurks nearby in a mysterious underworld. Writer-director Alfonso Cuaron's adaptation of the P.D. James novel, "Children of Men," is set in a ruined, post-apocalyptic England. Cuaron directed the third Harry Potter film as well as "Y tu mamá también". Cuaron's take on Harry Potter brought an eerie depth and a sense of real danger. Alejandro Gonzalez Inarritu's film "Babel," which features a global cast speaking five languages, portrays the cultural barriers we face in an era of globalization amidst wrenching inequalities of wealth and power. The film runs like a thread linking scenes from a Mexican village wedding, to a barren Moroccan desert landscape, to a Tokyo nightclub pulsing with a post-modern beat. Director Alfonso Cuaron, in a conversation on the ABC News program Exclusiva, said, "In many ways, I think these three films are a trilogy. We read each other's scripts and it goes beyond that — we are in each other's editing rooms, cutting … editing from each other's film." "I couldn't make a film without Alejandro and Guillermo telling me what to do. I think these three films share a sensibility about the world we live in and about humanity." Jimmy Shaw, the owner of the amazing Loteria Grill at the Farmer's Market in Los Angeles grew up in Mexico City. His restaurant is a meeting place of sorts for the Mexican film community and last week he was beaming at the attention being focused on their innovative films. Jimmy is set to open a branch of the Loteria Grill in Hollywood - walking distance from tonight's award ceremony and will be catering a party for the three directors and the Mexican film community. His food is also worthy of an Academy Award. 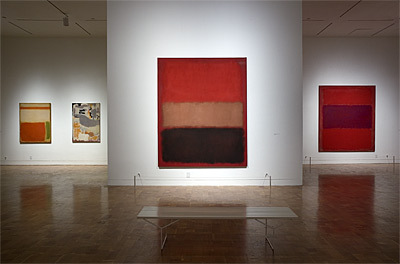 The recent exhibition of Mark Rothko's work by the Los Angeles Museum of Contemporary Art at their Pacific Design Center satellite space was both profound and encouraging. The paintings, many originally from the Panza Collection outside Milan, were crisply installed in the high ceilinged space and gently lit. 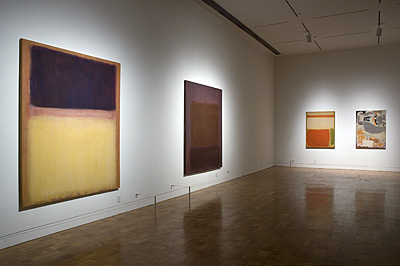 In one of the essays collected in the posthumous volume "The Artist's Reality", Mark Rothko expressed his hope that a democratically educated populace "through increased facilities for the seeing and practice and discussion of art, will actively and genuinely be moved by the creations of their contemporaries." I think that Rothko would appreciate the crowd that gathered to reflect upon his paintings. A group that took time to step away from an increasingly murky politcal reality to contemplate something deeper, richer and more lasting. Rothko wrote that "society profits most not when art at its highest applauds its appearances, but when it pictures its society's highest aspirations. The Renaissance was an age of murder. Greek freedom was based on slavery." Accompanying the Rothko paintings on the final weekend of the exhibition was a sound work by Steve Roden entitled "dark over light earth". Steve Roden's sound piece enlisted violinist Jacob Danzinger and added to the chapel-like feel of the space. 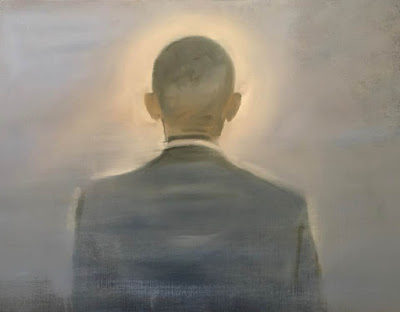 While I was there, gallery viewers spoke in hushed tones. There was a spirit of contemplation in the room. I wished that the moment could go on forever, that we all could soak into the paintings - breaking the space between object and viewer.